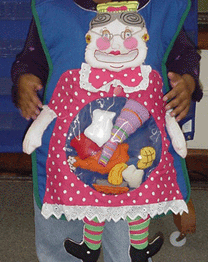 This is a storytelling apron that students can wear and feed the food pieces to the old lady. This apron can be purchased from Lakeshore Learning. Make a class book by doing an interactive writing sentence to illustrate each food the old lady ate. For example, “She ate pie.” (Let the children help compose and sound out the words for each sentence.) Students collaborate to draw food pictures for each page or use photos to illustrate each page of the book. Make an old lady by enlarging a basic shape of a woman. Cut out her mouth and her belly and laminate her. Hot glue a clear garbage bag to the back of her mouth that hangs down to her belly. Make pictures of each food item in the story for the kids to use to feed the Old Lady. You can also make word cards (pie, rolls, cider, etc.) to feed her after they feed her the food pictures. Later the kids match the food word to the picture. Make enough food pictures (like three pies, three rolls, etc.) so several kids come up when it’s their turn to feed the old lady.